If you have never tried a group fitness class and you are either a. in need of changing it up or b. in need of getting yourself back on track, I suggest you try out a group fitness class…like ASAP. I am one of those group-fitness-class-weirdos who literally will try anything. I have tried the gamete of classes, Zumba, Spinning, CX classes, Bodypump, Bodyflow, Bodycombat, Sha Bam, Yoga, Pilates…and the list seriously goes on. When I first moved down to Frederick on the top of my list of things to do was to find a gym that had group fitness classes that appealed to me. I found a gym that has all of the Les Mills classes, which were similar to my previous gym. Do you think people in my class were jealous of how cool I was taking pictures of myself!? My new favorite is the Les Mills CX class. This class has it got it goin on…for 30 minutes (yep, I said 30 minutes) you are taken through song after song of core work, leg work, arm work, and stretching. Each song is a different set of exercises…my favorite is the second track which is all plank work (ouchiee). The other nice thing about this class is that it is at 5:15am, so I can do this class and then run all before work…I am a morning work-out person, after school I am exhausted and lazy and not motivated and you don’t want to be around me. (sorry for those who have to be). 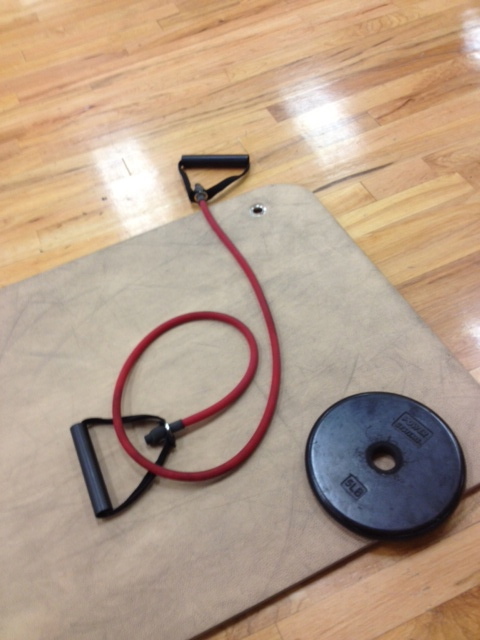 All you need is a mat, stretch cord, and weighted plate. All easy things to grab at 5:15 in the morning. Ohh and I forgot the most important part…you need to like the class chemistry and the teacher! 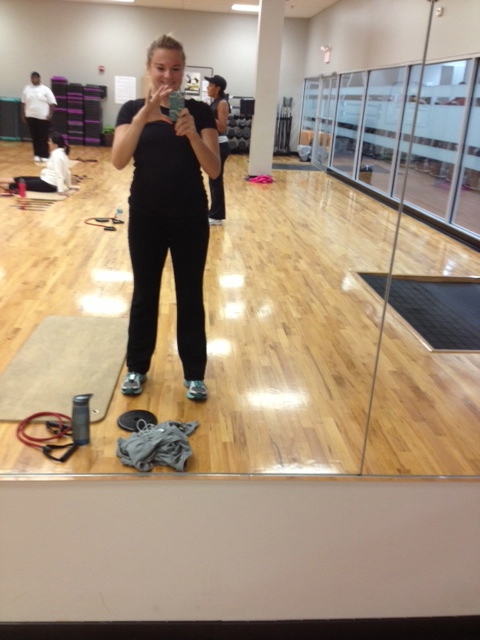 This instructor is awesome, she is someone I aspire to be one day…she is 58 and in amazing shape, she also works double shifts as a nurse and then comes in to teach CX class…like come on, really lady?? After you do a somewhat intense workout you must replenish with protein and my favorite thing in the entire world, oatmeal. I decided to try this because I was getting bored with the usual type of oatmeal and/or my usual protein shake. So I decided if you can add oatmeal to protein smoothies, why can’t you add protein to oatmeal!? Well it turns out you can, and you will love your life. It is so filling (I couldn’t button my school pants after this breakfast, pretty, I know). 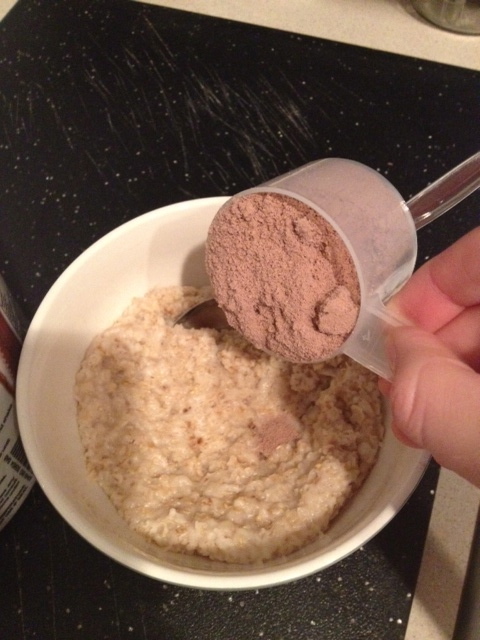 It is also so satisfying for your sweet tooth if you use chocolate protein powder! 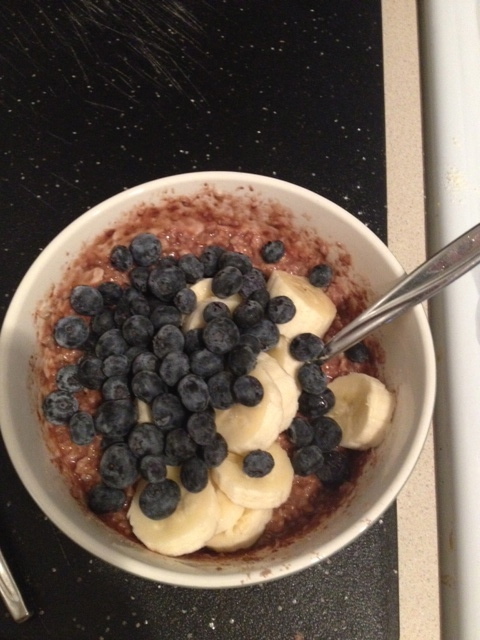 Add some berries of your choice, a banana and boooom the best breakfast ever! (well one of the best). I have heard you can put protein in all types of foods..pancakes, muffins, breads, etc…have you ever tried this before? Something I recently read said that protein powder/shakes is a “joke” and that we should get all of the “natural protein” we can from well…natural protein (fish, chicken, beef etc)…I feel sometimes that I do not eat enough protein because I hate making meat, I just am not good at it…so the protein powder is good for me…but I am still keeping my eyes open for a more natural substance, because if you read what it is in protein powder, well you may not know what the heck you are reading! Just some “food for thought”, get it?